PD. Pembangunan Sarana Jaya continues to complete number of facilities at Tanah Abang Skybridge, Central Jakarta.
" There are 26 CCTVs in total"
Besides smart toilets, skybridge will be also installed with Closed Circuit Television (CCTV). PD. 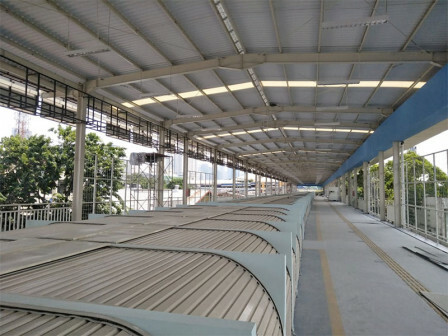 Pembangunan Sarana Jaya President Director, Yoory C. Pinontoan said, CCTV installation is needed to monitor and provide sense of security for visitors and merchants while conducting their activities at Skybridge. "There are 26 CCTVs in total. All of them have been installed along skybridge," he stated, Tuesday (11/20). He explained, 26 CCTVs at Skybridge will be managed by PT. Saranawisesa Properindo as the subsidiary of PD. Pembangunan Sarana Jaya. Those CCTVs will start to operate on November 23. "We plan to complete CCTV installation and operate it on November 23," he conveyed.